My initial impression, proved correct: the Kaimanwa feral horses are not nearly as colourful as their North American cousins. I did not see a blue or piebald coat amongst them, ever. Liver, roan and dun coats occurred but are not common. Most horses’ coats are best described as the classic bay, chestnut, or black. I once saw a couple of horses with grey pelage along the southern border of their range around Hautapu Stream, where long-haired fetlocks (feathered feet) were also seen – both evidence perhaps of more recent additions of domestic stock – but not in our study area centred in the Argo Basin or further north. In the present day population therefore, dominant white alleles are absent and grey alleles very rare. Alleles for spotting and tabiano patterns are probably absent, and roan alleles uncommon (see my post about coat colour genetics). Small white marks were present on just four adult horses, mostly across the loin or barrel. Perhaps this was evidence that alleles for patterning existed in the population. But clearly, if these alleles did occur, they were not common or influential enough to generate tabiano or sabino coats. However, the different shades of chestnut, bay and black, and especially the few liver and dun colours, I saw in our study population are evidence that subordinate alleles for hue are present to a small degree. 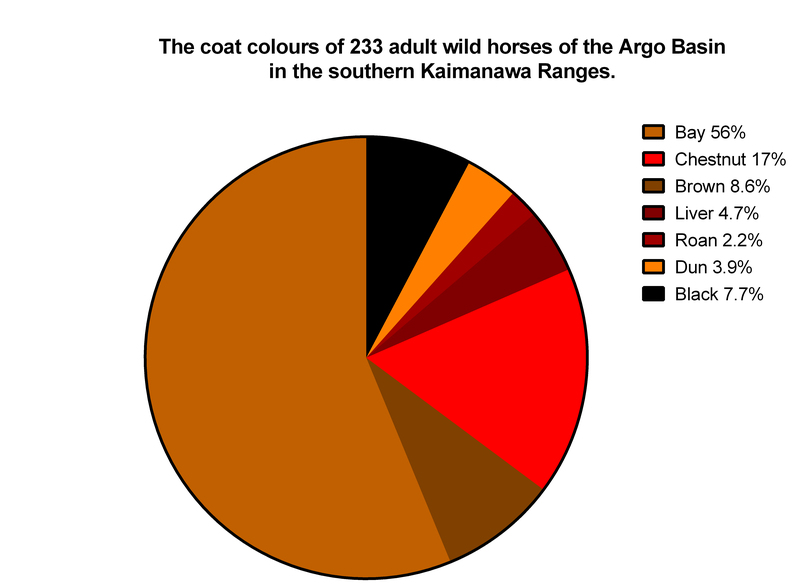 Instead, 90% of Kaimanawa horses could be described as bay (56%), chestnut-brown (26%) or black (7.7%) and so coat colours are dominated by just two alleles – red and black. What happened? Where are the grey, roan, blue, and piebald and skewbald from New Zealand’s wild horse past? In my next post, I explore why coat colours were lost.